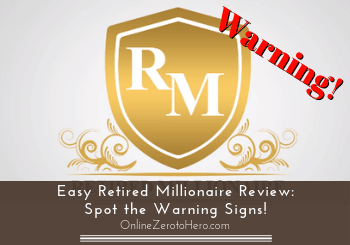 Easy Retired Millionaire Review: Spot the Warning Signs! It would be great to become a millionaire with just a few clicks of a mouse right? This is what Easy Retired Millionaire claims to help you with. But is Easy Retired Millionaire a scam, or is it really a great secret system? Let me reveal right away that the system has A LOT of warning signs, and a lot of signs it is a system to stay away from. In this Easy Retired Millionaire review I will show you these warning signs, and reveal what the sales page does not tell you, so you can see and judge for yourself before investing any money. If I could give less than 1 star, I would give less to Easy Retired Millionaire. It has sooo many warning signs – it for example uses fake video clips of the owner, fake testimonials, and makes a lot of exaggerated and unrealistic claims. Definitely NOT a system I recommend. What is Easy Retired Millionaire and what does it offer? When I first heard about Easy Retired Millionaire, I was honestly right away very skeptical. The reason for this was that I heard about in an email from Matt Neer, who is behind among other systems the Speed Wealth System. I have never seen him promote any program that I find to be worth it, and he promotes a lot of get-rich-quick schemes. I was therefore very skeptical from the beginning, but decided to take a closer look at Easy Retired Millionaire – here is what I found. The first thing is that you are not told much about what this so-called secret system actually offers. You are just told that it is a system that will help you make money with just 12 clicks. You can supposedly start earning with just 12 clicks – yeah right! The sales video also says that it will help you find opportunities online you can promote and earn commissions this way. This is through what is called affiliate marketing, where you can earn commissions by promoting more or less any product. This is definitely a real way to make money online, BUT when a program does not tell more about how it will actually help you earn, it is a big warning sign. So let me just reveal already now that I do NOT believe Easy Retired Millionaire will teach you how to earn easy money online, and how to do proper affiliate marketing. Not just for the few reasons I have already mentioned, but because it has sooo many other warning signs as well. Let me show you these, so you know what to consider and to be careful about before investing any money. A great way to see how trustworthy a system is, is to look at who the owner is. What is the reputation of the owner, has he/she created successful programs before, etc. When it comes to Easy Retired Millionaire, you are not told much about the owner. You are just told briefly that his name is Chris, and you see a small video clip of him and his wife Cathy traveling and enjoying the free lifestyle because the earn so much from this system. The problem about this video clip is just that it is a stock video clip. The video clip with the owner is from a stock video platform. As you can see on the image above, I found the exact video clip for sale and a stock platform. The video is described as a video you can buy with a young romantic couple in Venice. To really proof that this is not really the owner of Easy Retired Millionaire, I can show you that the same stock video platform is also selling video clips of “Chris” with a different woman, so people can choose what kind of couple they want. You can even buy the video clip with another woman. From this I think it is pretty clear that there really is no Chris and Cathy. And if a program use fake images and videos to show you who the owner is, is it then really a program you can trust? In my opinion definitely not, but this trick is not the only reason. Let me show you some further warning signs below. Easy Retired Millionaire warning signs revealed! I have already showed you what in my opinion are some really big warning signs about Easy Retired Millionaire. There are however many more you need to know about before investing any money. The whole idea behind the Easy Retired Millionaire secret system is that you can start earning with just 12 clicks, and you are told everything will be fully automated. It is a big warning sign, when you are told, you will earn without doing any work. It sounds great to be able to start earning thousands of dollars without having to do any work right? This is however just not the reality of internet marketing. You can definitely learn to make money online and eventually create a good income. But it will NOT happen automatically and overnight. Any program or system that claims this, is one to be very careful about. They are usually just trying to sell you a dream just to make money themselves. The video of the owner is not the only thing in the sales video that is fake. The testimonials from supposed users are also bought. 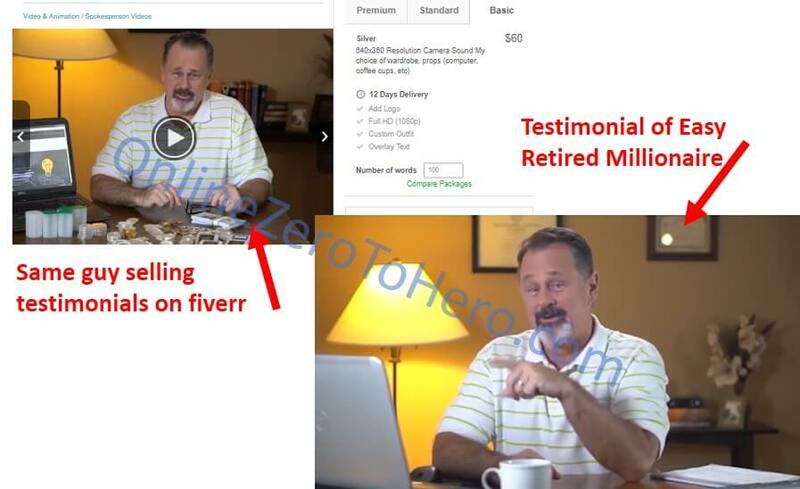 See for example this guy, who is telling how amazing Easy Retired Millionaire is – he is selling testimonials on the freelance portal fiverr. Example of one of the bought testimonials. I have seen the same guy in other testimonial videos – for example in the sales video for 12 Day Millionaire. When a program uses fake and bought reviews, it is a big warning sign in my opinion. If the system really was as great as the sales page claims, it should be possible to get real testimonials and reviews right? You are told while watching the sales video of Easy Retired Millionaire, your account has already been set up. “Chris” even shows you screen shots of the amount of money that is going in to your account just while watching the video. The account end up being $278, you have earned just while watching the video. You have supposedly earned $278 while watching the sales video – this is NOT true. What he shows you is a screen shot of a Clickbank account. It is definitely possible to get money into such an account through affiliate marketing. But again it will not happen just a few minutes after opening an account and automatically. It takes time and effort. It is just a sales trick – the account has NOT been set up during the video, and this money will NOT be yours, right after you join. 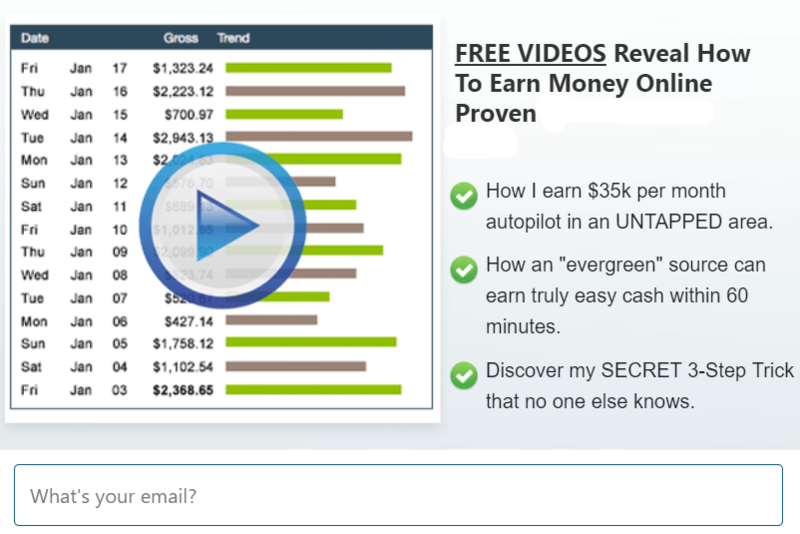 If you try to leave the Easy Retired Millionaire website, you get a pop-up that offers you a free video that will show you a proven way to make money online. The free video you can sign up for is useless. I decided to sign up for this to get a preview of the quality of what Easy Retired Millionaire offers. I got a link to a poor YouTube video with a walk-through of a paid survey site. The survey site in itself is legit, but it was presented as “the emergency cash generator”, and the video also shows you how to try to cheat, which is NOT going to work. So a poor video with poor advice. In addition to this I got a link to just another sales page of Easy Retired Millionaire. That is what you get, when you sign up for the free offer. It is clearly just a way to get your email, so they can keep sending promotional emails to you, and the material you get access to is VERY poor in my opinion, and to me was a clear sign that Easy Retired Millionaire is not focused on providing quality but on making money for themselves. It might not be clear right away why Easy Retired Millionaire is using all these sales tricks to get you to sign up. According to the owner himself, it is not to make money for himself. And you supposedly only have to pay a one-time server fee of $47. This is however NOT the full truth. After you join, there will be several upsells, and it can end up being very expensive. I looked at the promotional material for Easy Retired Millionaire, where it shows what they will pay people who promote the system in commissions. This reveals just how expensive it can become. The promotional material reveals the true price of Easy Retired Millionaire. Here it says that they will pay people that promote this system up to $351 per sale + commissions of re-billing. If this is the commission they are willing to pay, you can imagine the price you can end up paying will be VERY high. These commissions are also the reason why you will see some very postive Easy Retired Millionaire reviews that try to convince you to buy. I myself heard about the system from such a person, as mentioned earlier. Unfortunately, there are people willing to promote whatever makes them good commissions without thinking about the quality of what they promote. Also, notice that it says they will pay commissions on re-billing. This means you should expect there will also be recurring fees. Overall, Easy Retired Millionaire is not at all transparent about the price, and to me it is a big warning sign, when a system tries to hide the true cost. The last warning sign I want to go over is the false urgency pressure Easy Retired Millionaire puts on you. You are told there is only 15 spots available. Do not believe the claim about limited spots. You are even told that if you come back to this page later, it will not be there anymore. These are just ways to push you to make a fast decision. There will still be spots tomorrow, and there is definitely not only 15 spots available. False claims like this is to me just yet another warning sign about Easy Retired Millionaire. There are so many things you are not told, and it uses all kinds of tricks. I think it is clear from this review that I am not a big fan of Easy Retired Millionaire. But let’s sum up the pros and cons, so you can get a better overview and see why this is. I can honestly not come up with any positive things to says about Easy Retired Millionaire. It just simply has too many warning signs. Any program that claims you can start making hundreds of dollars online right away without any work is a program to stay away from in my opinion and experience. In addition to this you do not know who the owner is, fake testimonials are used, and it can end up being A LOT more expensive than you are told. It is definitely NOT a system I recommend. If you want to learn to make realistic money online step-by-step, it is however possible. You can check out my FREE guide to make money online that explains the exact steps I have used to create a full-time income. It requires work and effort, but is a realistic approach, and it can definitely be worth it to get the freedom that comes with an online income. If you have any comments, questions, or have any experiences with Easy Retired Millionaire yourself, I would love to hear from you in a comment below.